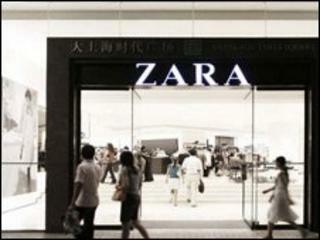 Fashion retailer Zara has opened its first store in India. Its Spanish owner, Inditex, has launched the outlet in Delhi as part of a joint venture with Indian conglomerate Tata Group. A second shop in Delhi, and an outlet in Mumbai, are due to follow in the coming weeks. Inditex is continuing with a rapid-paced global expansion for Zara that has helped cushion it from the economic woes being experienced in Spain. "Zara's arrival in India - the world's second most populous country, with 1.1 billion inhabitants - represents a new milestone in the Inditex Group's expansion in Asia," the group said. Inditex said Asia now accounted for 12% of its group-wide sales. It already has outlets in Japan, Singapore, Malaysia and Indonesia. More Western firms are entering the Indian marketplace on the back of the country's rapid economic growth, which is fuelling a big expansion in India's middle classes. Figures released on Monday showed that the Indian economy grew at an annual rate of 8.6% in the three months to March. However, under Indian law, overseas retailers first need to find a domestic partner. Spain exited recession in the first quarter of 2010, as its economy grew 0.1%, but it is struggling with an unemployment rate of 20%. The Spanish government is also continuing with austerity measures to reduce its significant public deficit from 11.2% to 3% of its economy by 2013. This is likely to further put pressure on Spanish consumer spending.